Biography: In the summer of 2001, Leilani ran her first race in Southern California where she fought for the lead for several laps and finished fourth. She has raced from shorts tracks to superspeedways, in both open wheel and stock cars. The series include Allison Legacy, NASCAR Weekly Racing, ROMCO Super Late Models, USRA Super Late Models, ASA, NASCAR Elite Division, ARCA Racing Series, and the Indy Pro Series. In 51 starts, Leilani has 9 top five finishes and 19 top tens. In 2002 Leilani moved from Southern California to North Carolina to pursue her racing career. In 2003 she had her first start in the NASCAR Weekly Racing Series at South Boston Speedway, she impressed many with her debut by finishing 9th. In 2004 the racing world took notice when she made her first speedway start at Texas Motor Speedway, setting a new record by qualifying 4th, the highest qualifying effort for a female driver at the track. She impressed in the race as well, finishing 7th. In 2005 Leilani began working as an instructor for Andy Hillenburg's Fast Track High Performance Driving School, giving ride-alongs and instructing at Charlotte Motor Speedway, Nashville Speedway, Kentucky Speedway, and Atlanta Motor Speedway - giving her valuable seat time behind the wheel on 1.5 mile speedways. In 2006 she turned heads in Texas again when she finished 4th, the highest finish for a female stock car driver in the history of the 1.5 mile speedway. The record still stands. That same year Leilani became the first woman to qualify in the 45 year history of the Bettenhausen Classic at Illiana Speedway in Indiana. At the All Star late model race, only Leilani's second start at Madison International Speedway, her best lap time of 18.843 was only 0.358 of a second off of the best lap time of two time NASCAR Nextel Cup Champion Tony Stewart's best time. Leilani was the only female driver to make the field. Later that year, Leilani was running second in a late model race at Madison International Speedway in 2006 when, on the last lap, she was bumped by the car racing her for second place; she finished fifth. Her best finish in 2006 was third place, which also came in Madison. 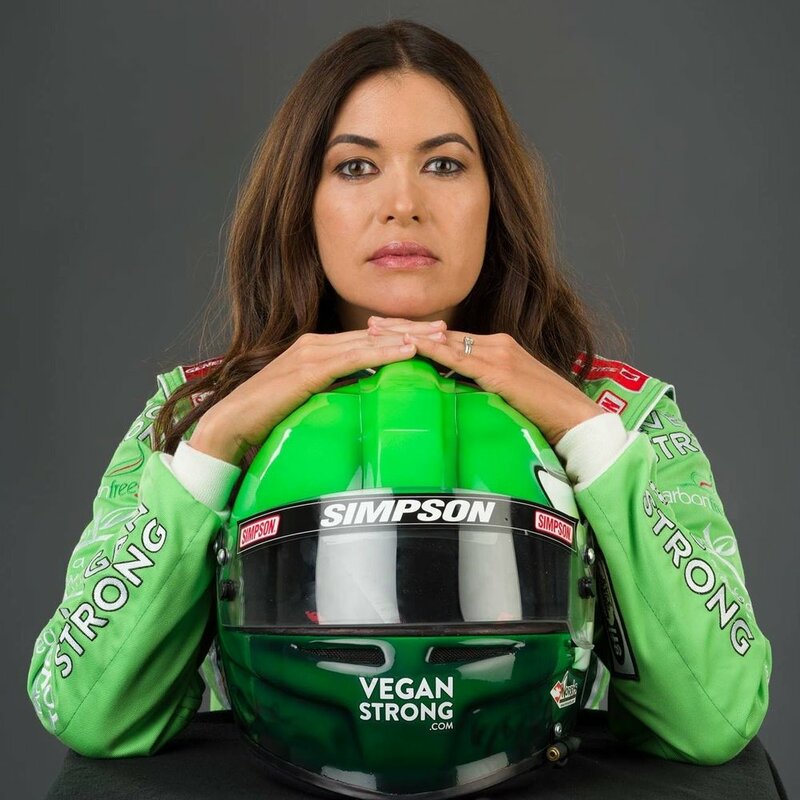 In December 2006, Leilani passed her rookie test at Daytona International Speedway and became licensed to race at the most famous track on the NASCAR circuit. She was 24th quick of 59 race cars testing in her very first laps at Daytona. In 2007 Leilani became the fourth woman in history to race in the Indy Pro Series, the developmental league of IndyCar. She impressed IndyCar veterans across the board when she qualified 5th and turned in the 5th-fastest lap of the race with a speed of 192.399 mph. She had trouble on a restart and dropped back to 13th but dazzled the crowd by racing her way back up to the front of the field. With 20 laps to go, Leilani was about to pass for 4th place when she was collected in a multi-car accident when another car cut a tire. Four-time Indy 500 champion Rick Mears, IndyCar driver Jaques Lazier, and many others in the IndyCar community spoke very highly of Leilani after her debut. Leilani's next race in open wheel was at a track she had never been to before - Chicagoland Speedway. In her first laps at Chicagoland, Leilani was 5th quick in practice session for the Indy Pro Series Chicagoland 100 with a speed of 191.894 mph. She finished 13th in the race in what was to be her last open wheel start - due to lack of open wheel sponsorship, Leilani moved back to stock car racing, a more popular form of motorsports in the USA. In 2010 after three successful tests at Daytona where Leilani showed speed and consistency, Leilani raised enough sponsorship to make her Daytona debut, driving the first ever 100% eco sponsored race car with 6 environmental companies teaming up to get her car on the track. Leilani was one of only three women to qualify for the 2010 race on speed alongside Danica Patrick and Alli Owens. Leilani was 2/10 of a seconds faster than the leaders and had just turned the fastest lap of the race up when she was caught up in "The Big One" after a veteran driver spun and collected 10 race cars, including Leilani. Leilani returned to Daytona in 2012, this time she was driving the first ever ocean awareness race car to hit the high banks of Daytona International Speedway when she carried the colors of The Cove on her race car. Leilani drove the #12 The Cove entry for Mark Gibson Racing in her second ARCA race at Daytona, the car was crowd funded by donations from individuals and organizations all over the world that were touched by the documentary. Leilani was 25th of 52 cars in practice with a speed of 181.873 mph, she qualified 26th of 54 cars for the race. On lap 13, Leilani's left rear tire's inner liner blew out coming out of turn two and she finished 36th. Later in the year, Leilani returned to ARCA for her first race at Kansas Speedway. She was 16th quick when she tested Kansas Speedway for the first time, but when Leilani returned to race her engine overheated after just 5 laps. In December 2013 after over a year passed without sitting in a race car, Leilani got behind the wheel of the #55 entry of Venturini Motorsports for the ARCA series pre-season testing at Daytona. She was fast right out of the box, posting the 6th quickest time of 78 race cars testing with a speed of 183.303 mph. Leilani was the fastest female driver at Daytona testing. She ran a tribute to Nikola Tesla on her race car at the Daytona test. Leilani returned for the Daytona ARCA race in February 2014 behind the wheel of the #55 Go 100% Renewable! race car promoting 100% renewable energy from the sun, wind, and water in a collaboration with The Solutions Project. Leilani was 5th quick of 43 race cars in drafting practice at Daytona and 2nd quickest in single car runs. She qualified 7th of 43 cars but after ARCA tech reported a spring was sitting incorrectly, she started the race 33rd. Leilani raced her way from 33rd all the way up to 9th place in just 22 laps just to get taken out by a spinning car. In April 2014, Leilani took her first laps at Talladega Superspeedway, the largest oval in the world. She was fast right out of the box posting the 4th quickest time of 20 race cars testing with a speed of 183.367 mph on the 2.66 mile super speedway. She returned to race in May driving a race car painted like an orca to promote the CNN documentary Blackfish. The Blackfish car was sponsored in a large part by co-creator of The Simpsons, Sam Simon, who attended the race. She had a strong debut race at Talladega Superspeedway, qualifying 8th of 37 race cars with a speed of 180.976 mph. She ran as high as 4th and stayed in the top 8 cars the entire race until the final restart with 13 laps to go, when she was bumped from behind and was shuffled back for a 14th place finish. Leilani's next race was in July 2014 in the #66 PrairieGold solar car at Chicagoland Speedway. Leilani had an impressive run at Chicagoland, qualifying 16th and finishing 12th on the lead lap in her first start on a 1.5 mile track in over four years. She followed up Chicagoland with another 12th place finish at Kansas Speedway in a renewable energy themed car, the #66 Energy Freedom entry for Venturini Motorsports. Leilani participated in ARCA pre-season testing at Daytona where at one point Leilani was the top of the leaderboard in all three test sessions she participated in. She ended up 7th of 52 cars overall in the two day test. Leilani returned to race at Daytona in the #66 Energy Freedom entry for Venturini Motorsports. She qualified 10th of 49 race cars with a speed of 186. 587 mph, her highest qualifying effort for Daytona. Leilani ran in the top ten for much of the race, running as high as 7th. She came out of pit stops on lap 38 in 12th place. On lap 53, Leilani was running 15th when going three wide into turn 3 she and the car to her outside touched and wrecked. It was discovered after the wreck that Leilani had severe carbon monoxide poisoning and she was immediately put on oxygen for several hours before the doctors would release her from Daytona's infield care center. Münter stated later that the doctor told her the wreck may have saved her life: had she finished the race, her doctor told her she may have gone to sleep in her hotel and never woken up the next morning because there are no symptoms of carbon monoxide poisoning, you simply get tired and fall asleep. In February 2017, Leilani made her return to the ARCA Racing Series at Daytona International Speedway in the No. 15 Vegan Powered race car for Venturini Motorsports. She ran an incredible race, racing her way all the way into the 4th place position with just 25 laps to go. On the backstretch the race car behind Leilani made heavy contact with her rear bumper, causing a multi-car accident. Münter was praised widely by the racing community and Fox Sports television commentators for her performance. • 2009 - Tested the #59 NextEra Energy Resources Dodge owned by Mark Gibson Racing at Daytona International Speedway in pre-season testing for the ARCA Racing Series. • 2010 - Debut at Daytona International Speedway in the ARCA Racing Series. • 2011 - Drove a Ford owned by Andy Hillenburg to 14th quick on the charts with a lap of 181.815 mph on the final day of Daytona pre-season ARCA testing. This was Leilani's fourth test at Daytona, but her first time since they repaved the racetrack. • 2012 - Drove the #12 The Cove entry for Mark Gibson Racing in her second ARCA race at Daytona in the first ever ocean awareness race car. • 2013 - After over a year passed without sitting in a race car, Leilani got behind the wheel of the #55 Go 100% Renewable! entry of Venturini Motorsports in the ARCA Racing Series. • 2014 - 5th quick of 43 race cars in drafting practice at Daytona and 2nd quickest in single car runs. • 2015 - Returned to race at Daytona in the #66 Energy Freedom entry for Venturini Motorsports. She was 14th quick in practice and qualified 10th of 49 race cars with a speed of 186. 587 mph.